Great product for a beginner like me. 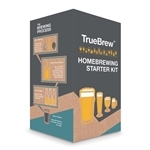 Easy to read step by step instructions that calmed my first time brewing fears. La homebrew has a knowledgeable staff if any questions came up they had the answers. Had a blast on this first run, can’t wait to start the next sesh!